Elizabeth Marie Tall Chief (stage name Maria Tallchief; January 24, 1925 - April 11, 2013) was the first person of Native American descent to become prima ballerina for a major company. She is especially well known for her time with the New York City Ballet, where she performed between 1948 and 1965. 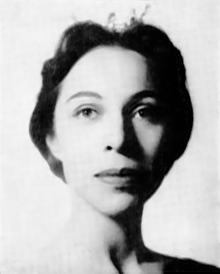 Maria Tallchief grew up on an Indian reservation in Oklahoma. Her father was Osage. Her mother was Scottish-Irish. She started doing ballet at age four. By the time she was eight, she had already gone through all teachers at her level in Oklahoma, so her family moved to Beverly Hills. She was trained by Bronislava Nijinska, David Lichine, and George Balanchine. Balanchine became her husband in 1942. She starred in many of her husband's ballets including The Firebird. After she starred in The Firebird, she got international recognition. She was an artistic director of the Chicago City Ballet from 1980 to 1987. She was recognized in the National Women's Hall of Fame. Maria Tallchief died due to complications from surgery to fix a broken hip at the Northwestern Memorial Hospital in Chicago at age 88. ↑ Howard Chua-Eoan (April 12, 2013). "The Silent Song of Maria Tallchief: America's Prima Ballerina (1925-2013)". Time. Retrieved April 16, 2013. Anderson, Jack. "Maria Tallchief, a Dazzling Ballerina and Muse for Balanchine, Dies at 88." New York Times Apr 13 2013, Late Edition (East Coast) ed. ProQuest. 29 May 2015. Matheson, Katy. "Tallchief, Maria." World Book Advanced. World Book, 2015. Web. 29 May 2015. This page was last changed on 1 December 2018, at 03:44.